The New York Yankees visit Angel Stadium on Sunday to play the Los Angeles Angels. The probable starters are Chad Green for the Yankees and Jhoulys Chacin for the Angels. The opening line for this matchup has New York at -115 and Los Angeles at +105. The over/under was set at 9. The Yankees have a 53-59-9 over/under record and a 58-63-0 run line mark, meaning they cover 48% of the time. The Angels are 58-63-0 against the run line and have a 55-61-5 over/under record. They cover the spread 48% of the time. The Yankees head into this matchup with a 62-59 record, including 27-32 on the road. Starting pitcher Chad Green has a 2-2 record with an earned run average of 4.05 and a WHIP of 1.26. He has 40 strikeouts over his 33.1 innings pitched and he has given up 32 hits so far this season. He has allowed 8.6 hits per 9 innings and he has a FIP of 4.77. The bullpen this year has an earned run average of 3.51 and they have given up 301 base hits on the year. Teams are hitting .217 against the bullpen while being struck out 440 times and walking 119 times this season. As a team, New York has allowed 8.63 hits per nine innings while striking out 9.03 batters per nine. They are 19th in the league in team earned run average at 4.29. The Yankees pitchers have collectively given up 1,023 base hits and 508 earned runs. They have allowed 157 home runs this season and they allow 1.3 homers per nine innings as a staff. New York as a pitching staff has walked 312 batters and struck out 1,070. They walk 2.6 men per 9 innings while striking out 9 per 9. They have a team WHIP of 1.25 and their FIP as a unit is 4.05. As a team, New York is batting .251, good for 18th in the league while putting together a .252 average away from home. The Yankees hold a .402 team slugging percentage and an on-base percentage of .312 which is good for 23rd in baseball. They rank 22nd in baseball with 8.44 hits per game. Didi Gregorius comes into this game hitting .285 and his on-base percentage is at .314. He has 119 hits this season along with 52 runs scored and 56 runs batted in. He's struck out 59 times and has walked 14 times. Brett Gardner is hitting .263 and he has an on-base percentage of .351. He has totaled 105 hits so far while scoring 61 runs and he's driven in 29. He has walked 50 times and has struck out 86 times. The Yankees have 1,021 hits, including 180 doubles and 133 home runs. They've stolen 54 bases while they've been thrown out stealing 16 times. New York has walked 341 times this season and they've struck out 870 times as a unit. They've left 798 men on base and have a team OPS of .714. They score 4.17 runs per contest and have scored a total of 505 runs so far this year. Los Angeles comes into this matchup with a 28-32 home record and a 51-71 overall mark. With an earned run average of 5.92, Jhoulys Chacin has a 3-8 record and a 1.55 WHIP. He has 80 strikeouts over the 103.1 innings he's pitched during which he has given up 117 hits. He has allowed 10.2 hits per nine innings and his FIP stands at 4.5. So far this season the bullpen has an earned run average of 3.93 and they have given up 390 base hits on the year. Teams are hitting .249 against the Angels bullpen while being struck out 331 times and walking 137 times this season. As a team, Los Angeles has allowed 7.64 hits per nine innings while striking out 9.32 batters per nine. They are 5th in the league in team earned run average at 3.73. The Angels pitchers as a team have surrendered 1,146 base knocks and 549 earned runs so far this season. They have given up 166 home runs this year and they give up 1.4 home runs per nine innings as a staff. Los Angeles as a staff has walked 376 hitters and struck out 855. They give up a walk 3.2 times per 9 innings while they strike out 7.2 per 9. Their team WHIP is 1.42 while their FIP as a staff is 4.75. As a team, they are batting .251, good for 19th in the league while putting together a .248 average at home. The Angels hold a .413 team slugging percentage and an on-base percentage of .321 which is good for 19th in baseball. They rank 18th in baseball with 8.59 hits per contest. 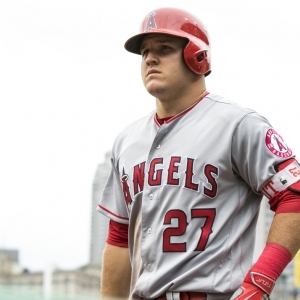 Mike Trout comes into this matchup batting .310 and he has an OBP of .427. He has 131 hits this year along with 94 runs scored and 77 RBI. He's struck out 104 times and has walked on 84 occasions. Yunel Escobar is hitting .320 and he has an OBP of .368. He has collected 140 hits so far while he's scored 58 runs and drove in 34. He has earned a walk 33 times and has punched out 54 times. The Angels as a unit have 1,081 base hits, including 208 doubles and 117 homers. They have 43 stolen bases while they've been thrown out 25 times. Los Angeles as a team has walked 358 times this year and they have struck out 729 times. They've had 790 men left on base and have an OPS of .730. They score 4.48 runs per game and have totaled 547 runs so far this season.